Online shopping is not an exotic experience it used to be 10 years ago. Thanks to the steep computerizing of the global society, people have stopped being afraid of pulling out their wallets online. And though customers got less suspicious about e-shopping , they became more experienced either. Spoiled and picky, if you will. Just imagine: you spend a whole fortune on customer acquisition channels to bring them by, and when you eventually do… Shoppers hastily look through the storefront, smell something “fishy” and - unbelievably! - exit. Why? Quite probably your store doesn’t instill trust in customers. Being afraid of becoming a fraud victim or getting a low quality service, customers often act quite uncertainly. Whatever bothers them - hidden costs or credit card security - prove you’re an honest merchant they can trust. So what customer fears are and how can you address them? You would be surprised to know how many customers you lose because of the fear that your e-store is fake. Even if you may never know what disturbed this or that customer in particular (or whether he or she just changed their mind), there are some ways to increase the level of store credibility. Put design above all. Though design preference is a subjective matter, you always can say whether it’s qualitative. But when the design looks like an experimental creation of the 90’s, it’s hardly of a high quality. Consequently, you need to make sure your website is pleasurable to look at and comfortable to use. Good store design is the first and the strongest indicator of an honest and successfully functioning online retailer. Provide a physical address. To convince shoppers you’re not just an internet ghost and actually located somewhere, provide them with your physical address. Even a post office box number would be enough to ensure customers you can be reached by kicking the door down. Also, if you have a physical store, map it on Google Maps to earn additional credibility. Show your personality. Prove there are real people behind the storefront by neatly filling out “About Us” or “Our Team” page. Reveal your appearance by publishing a several photos from any important event, vacation or corporate celebration. Don’t forget to put a story behind your business either: who are you, what are your aims, what inspires you and keeps moving forward? Since the internet is swarmed with fraud websites, some people might raise the question of whether your store is safe. Here are some tips that may convince shoppers you’re a good guy. Install SSL certificate. SSL is a cryptographic protocol that is used to secure the data sent across website pages. It successfully protects credit card transactions as well as other sensitive data like login details and personal information. Once you’ve bought and installed a SSL certificate, customers will ensure you care about their safety by seeing https instead of http before your website name. Use familiar trustmarks. Nearly ¾ of shoppers agree that trust logos do affect their sense of confidence in a particular website. The thing is, though customers might not recognize the logo of your store, most probably they will indicate the presence of PayPal, Verisign or McAfee ones. And since many first-time visitors feel uncertainly about small online retailers, trustmarks can play a big role in convincing shoppers you worth their attention. Even when customers know your store is real and most probably safe, they might still be afraid of getting a low quality service. How to prove contrary? Give shipping guarantees. Ensure you partner with trustworthy shipping suppliers and, if possible, joy your customers with an opportunity to track their packages online. In case you do fail to ship the product on time or a package goes missing, treat it as a chance to demonstrate others your excellent customer service and offer something in return. It can be a gift, a replacement or a discount on a future purchase - whatever can soothe customer’s disappointment. Write returns policy. Give customers the feel they always have an opportunity to beat a retreat being unsatisfied. The best way to do so is to declare customers’ right for returns, exchange and refund in a written form. If your business can handle the additional costs, offer a free shipping along with the returns. But whatever policy you decide on, make certain it’s easy to find on your website. Help your customers. Prove your service is of a high quality - let the customers know you’re there for them. To start with, write a short FAQ addressing some major questions concerning your store, products, returns policy, etc. For a direct contact, establish a toll-free telephone line and install an online chat plugin. 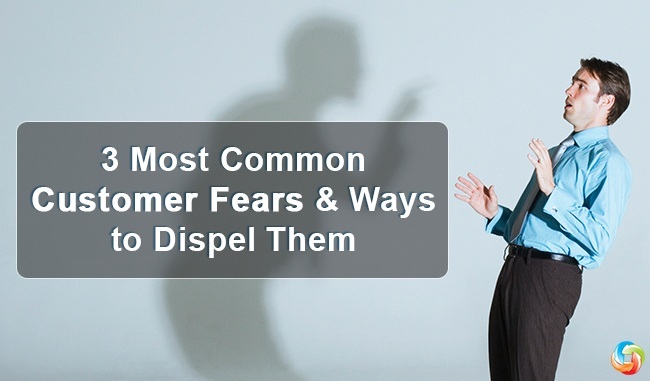 These are 3 most common customer fears and effective ways to address them. Have something to add? Feel free to share it the comment section below!